Various races are competing for your attention on the ballot this election season. You know the high profile races for President of the United States, the U.S. Congress and the State Legislature. Yet, near the bottom of your ballot is one of the most important races - one that will directly impact you and your water. It is the election of five new members to the Central Arizona Water Conservation District Board of Directors. If you are wondering what that is, you are not alone. 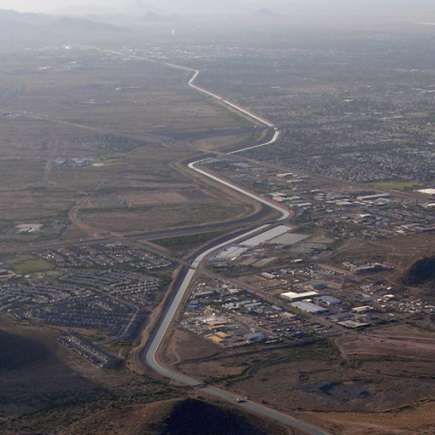 The Central Arizona Water Conservation District (CAWCD) is the official legal name of the Central Arizona Project (CAP), the 336-mile canal that delivrs Colorado River water from Lake Havasu to Phoenix and Tucson. The CAWCD Board of Directors is responsible for maintaining the more than 30-year-old CAP canal. Board members also set rates charged to its customers (including Valley cities), determine the taxes you pay to finance the CAP system, and establish policies to manage CAP water. The CAWCD Board is a 15-member board with 10 elected from Maricopa County, four elected from Pima County, and one from Pinal County. This year, Maricopa County voters will elect five of the Board positions. You are electing them to a six-year term, the same as for U.S. Senate. It’s not a high-profile race, so you may have to do a little more homework on the candidates. It is worth taking the time. The CAWCD has the authority to set two property taxes for Maricopa, Pinal and Pima counties. For the median priced home in Maricopa County - valued at $174,000 in 2016 -these taxes amount to roughly $24 a year. These taxes are used primarily to repay the Federal government for constructing the CAP canal, operation and maintenance of the CAP system, and storage of Colorado River water for times of shortage. This is a nominal amount for the wise, long-term effort to keep our water future secure. During the next six years, many critical issues will be facing the CAWCD Board—in particular, setting the rates that utilities pay for Colorado River water delivered through the CAP. Those costs are eventually passed on to you, the utility customer. And those costs are likely to increase. Here are some of the reasons why. 1. The U.S. Bureau of Reclamation could declare an official shortage of Colorado River water as soon as 2018. A shortage would initially result in less Colorado River water delivered to CAP’s agricultural customers. Cities would still receive their full allocation of Colorado River water under an initial shortage declaration but cities also would pay more for their water. CAP must continue to generate enough money to maintain its delivery system, so cities would pay more to make up for lost revenue from agriculture customers. 2. It takes a lot of energy to move and lift Colorado River water uphill. Ninety percent of CAP’s power comes from the Navajo Generating Station located on the Navajo Indian Reservation near Page, Arizona. New land and coal leases will be in place in 2019, which will increase the cost of CAP’s delivery of Colorado River water. 3. CAP must determine how it will recover Colorado River water stored in underground aquifers by the Arizona Water Banking Authority. If shortages do become more serious, municipalities would need that stored water, and recovery of that water by CAP could be expensive. 4. CAP rates are directly linked to the operation and maintenance of the canal. As the CAP’s infrastructure continues to age, maintenance costs will rise. The cities are key CAP customers. Maricopa and Pima County cities with CAP contracts provide water to more than 85 percent of Arizona’s population. CAWCD Board and the cities receiving CAP water will be facing important issues over the six-year terms of the candidates you are electing. It will be critical that we work together for solutions that ultimately ensure you have secure, safe water at a reasonable price. The CAWCD Board is a voluntary non-paid, non-partisan position. It truly is public service and it remains important not to mix partisan politics into water. So, do a little research. Talk to water professionals if you know any. Search online to find out more about the candidates and who and what groups are endorsing them. Make a well-educated selection. Above all, please do not just randomly vote or pick names that sound good. Share what you have learned with family, friends, and co-workers so they can also understand the importance of the CAP election. Here are the ten candidates who are running for the CAWCD Board with a link for those who have a campaign website. Kudos to the candidates for running and for understanding the importance of CAP water to Maricopa County and the rest of Arizona. Warren Tenney was elected twice to serve as a member of the CAWCD Board from Pima County. He served as Vice-President of the Board and as Chairman of the Board's Finance, Audit & Power Committee. He resigned his board position in January 2016 to become Arizona Municipal Water User Association's executive director.